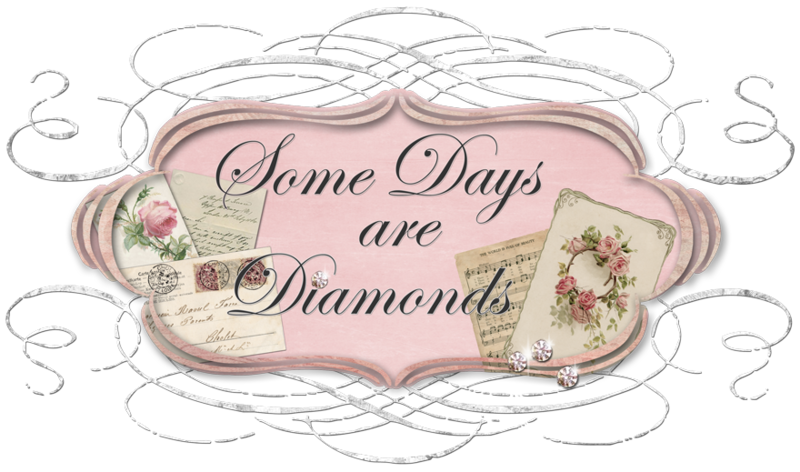 Some Days Are Diamonds: Thank You Catherine!!! Here it is all out of the box. What beautiful wrapping! Lots of fun ribbons and a sweet little fabric bag. And tucked inside was . . .
a beautiful pink runner with four rhinestone dangles on each corner. A wonderful little gold rimmed teacup. A box of yummy Hedleys Tea (can't wait to go downstairs and brew me a cup of that right away!) A darling ornament that is going right upon my Inspiration Board. And handmade notecards made by Catherine herself! How very, very fun to win something so pretty, so unexpectedly! To hear the doorbell ring on a cold rainy day and find a gift! And Catherine was just the best! Thank you so much Catherine!!!! I will treasure each and every thing!!! that is a great gift! lucky you. the pink runner would be awesome. cards are adorable. Congrats to the lucky you. So many fun gifts! Congrats to you! Congratulations on wining my girlfriend's wonderful goodies. Lucky you Karen, you deserve it. I came over from Dawnie's blog. I enjoyed reading your profile...I was raised in Southern Calif. My niece lives in Lake Arrowhead, not far from Big Bear. I miss the beaches of Calif. and the winter weather!!!! My patient is doing fine and I am ready to send him back to work. He has a walking boot now and he is up constantly walking without his crutches and he isn't supposed to be. I can't make him be still.